Built by Electro-Motive Division of GM, LaGrange,IL; August 1959. 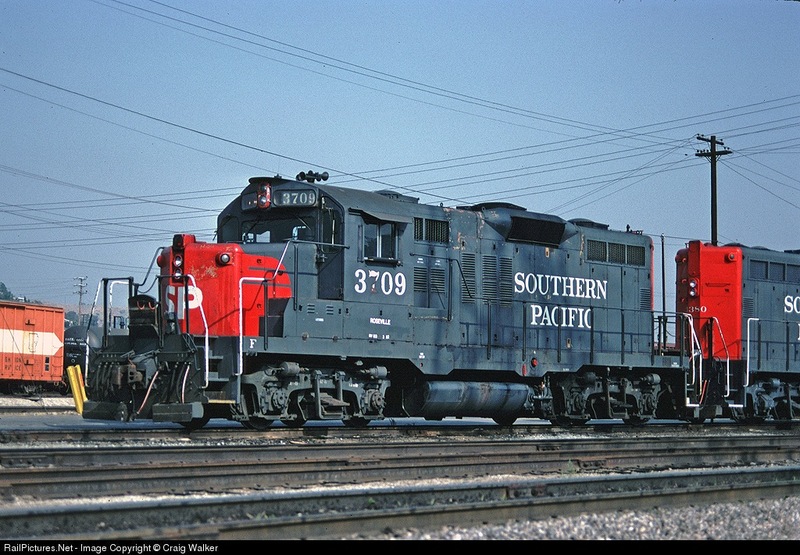 SP 5873 (3709) was part of SP’s last order of GP9’s, and was the second GP9 produced for the SP with a low nose. It was delivered in August 1959 with serial number 25632 and frame number 5608-2. This locomotive was built as a Phase III unit with 48” fans, and painted in the “Bloody Nose” paint scheme. These were among the last GP9s built by EMD for a US customer, and the only order of low nose GP9s built for a major railroad. 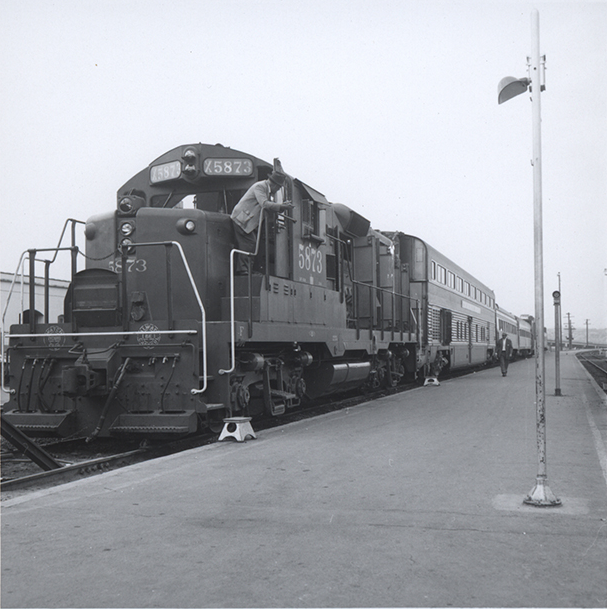 In 1965, SP renumbered all of their GP9 locomotives in roughly the same order they were delivered, and at this time SP 5873 became SP 3709. It appears this loco never went though one of the big SP rebuild programs, but there are indications that it was rebuilt at some point by SP. SP retired it from the roster in December 1986. SP 3709 at Taylor Yard in Los Angeles, CA on May 14, 1982. Craig Walker Photo. 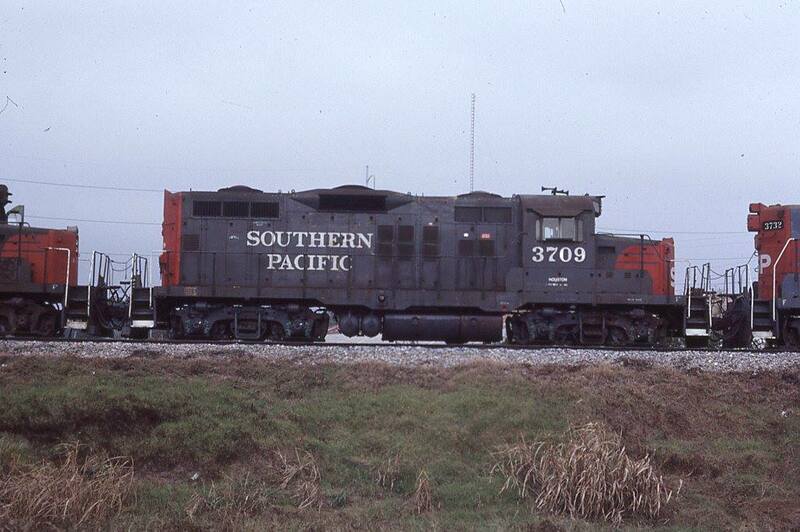 Seen here in the middle of a lashup in February 1987, SP 3709 provides some extra power at New Orleans, LA. Earl Hampton Photo. In February 1987 it was sold to the U.S. Army Transportation School as their 002. Later it became Department of Transportation 1401 and then the United States Marine Corps 296619. At one time the lettering on the side said U.S. Army, but the Army portion has since been painted out – most likely because this unit has been assigned to the USMC’s Camp Pendleton. 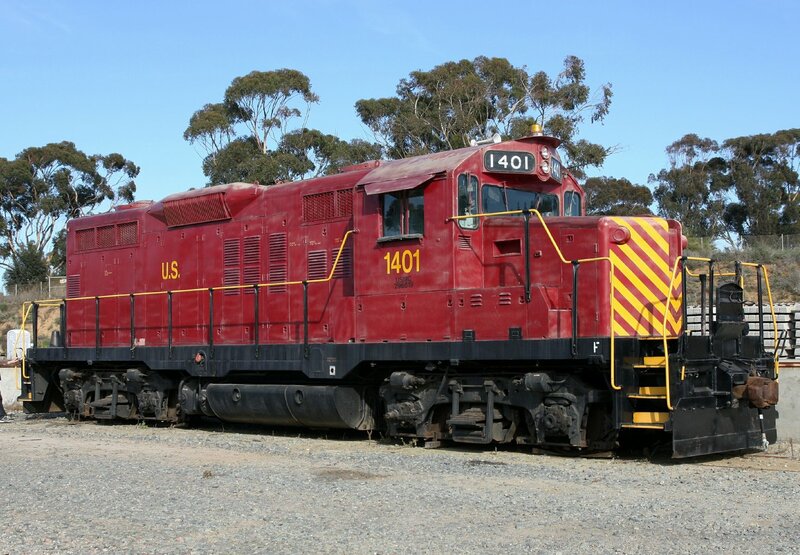 We believe that the locomotive last operated on Camp Pendleton some time in 2011 or 2012. The locomotive is generally in good condition and a great candidate for a full restoration to operational condition. Restoration plans call for the re-installation of the full SP-style light packages and a fresh paint job in the “bloody nose” style when time and funds permit. PSRMA would like to thank Bill Sign’s Trucking & Bob’s Crane (both from Lakeside, Ca) for their help moving this locomotive to Campo, Ca and safely returning her to the rails. We would also like to thank Asbury Environmental Services for removing and recycling the fluids from it. It’s not too late to get in on the ground floor of the restoration and return to service of this locomotive, if interested please contact Robbie Smith at rbrtsmith396@gmail.com.